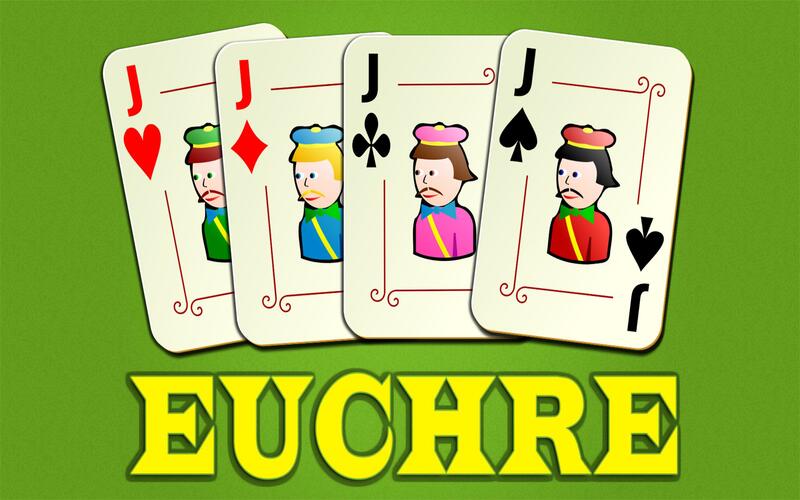 ✓ Euchre is a trick-taking card game. To win the game you must take as many tricks as you can. The game starts by choosing a card suit. 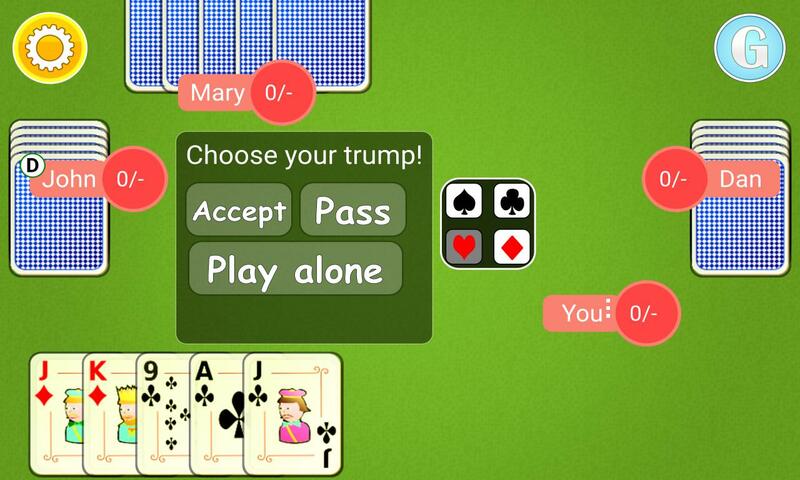 ✓ In the first round you can choose the trump suit by choosing the card from the center pile. ✓ If the current round passes without choosing the trump a second one follows. ✓ In the second round you must choose any suit of cards except the one you passed in the round before. ✓ If the trump is not chosen in these 2 rounds the cards are reshuffled and the game starts again without changing the dealer. ✓ Once a trump suit is chosen the game can start. ✓ If you choose a trump suit in the first round, the card in the center pile is passed to the dealer of the cards. ✓ If you are the dealer of the cards, your name is marked with an encircled D. If the trump is chosen in the first round you receive the trump card and must shed any card you wish. ✓ The player next to the dealer in a clock-wise direction is the first to choose a trump suit. ✓ If that player passes the chance, the next one after him follows. ✓ The game is played between two teams: a top-bottom team comprised of you and a computer player and a left-right team of computer players. 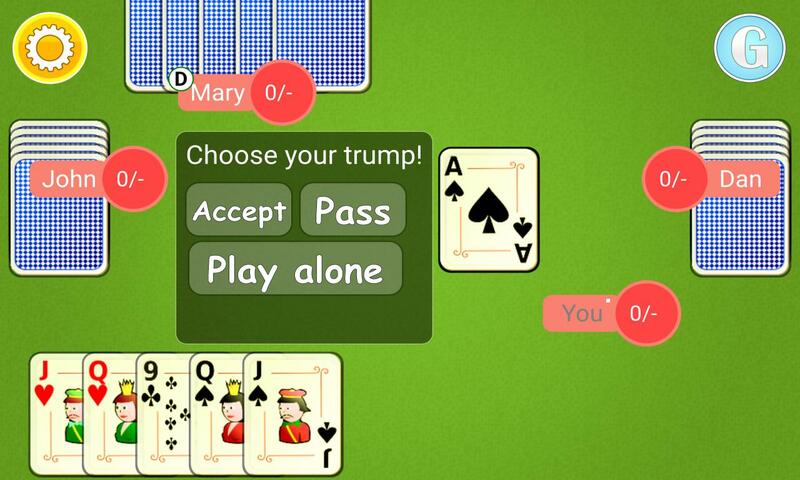 ✓ The player and his partner are called the makers if one of them chooses a trump suit. Otherwise they are called the defenders. ✓ To win the makers must take at least 3 tricks. The defenders in order to win must take at least 3 tricks as well. ✓ If the makers take 5 tricks they score 2 points. If the defenders take 3 or more tricks they score 2 points. ✓ If the makers take 3 or 4 tricks they score 1 point. If the makers take less than 3 tricks they score 0 points. ✓ There is the possibility of playing alone by pressing the -play alone- button when choosing the trump. ✓ When playing alone the team scores 4 points if the maker takes all 5 tricks. Otherwise if the team takes 3 or 4 tricks it scores only 1 point. ✓ There is a specific order of the trump cards. 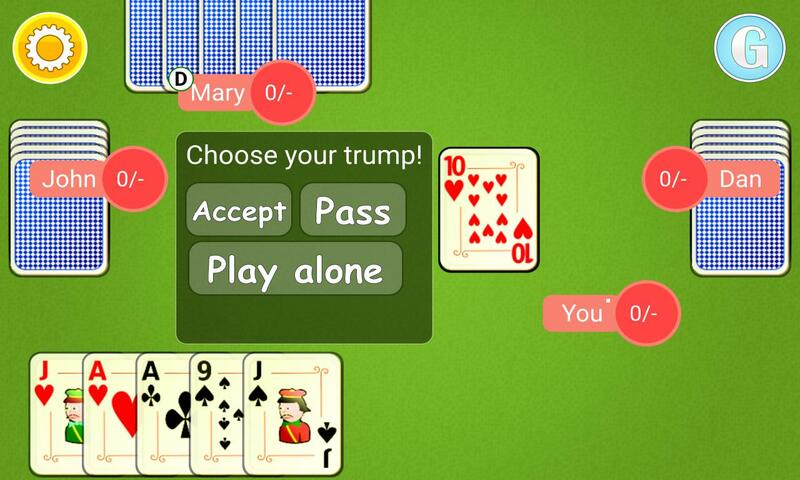 The trump Jack is the most valuable card, followed by the Jack of the same-color suit. ✓ For example if the trump suit is hearts, the most valuable card is the Jack of hearts followed by the Jack of diamonds. 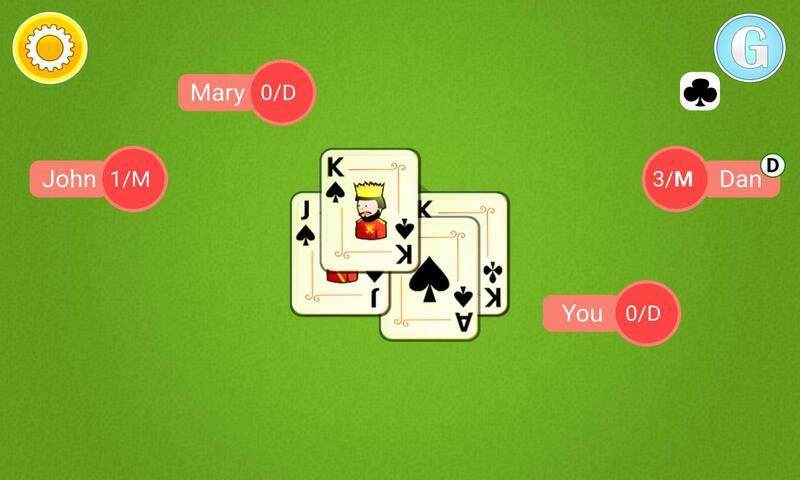 ✓ These cards are followed by the Ace, the King, the Queen, the 10 and the 9. ✓ There are only 24 cards in the deck - 6 from each suit. ✓ The order of the cards in the other suits is the Ace, the King, the Queen, the Jack, the 10 and the 9. ✓ The Jack of the same color as the trump suit makes part of the trump suit. 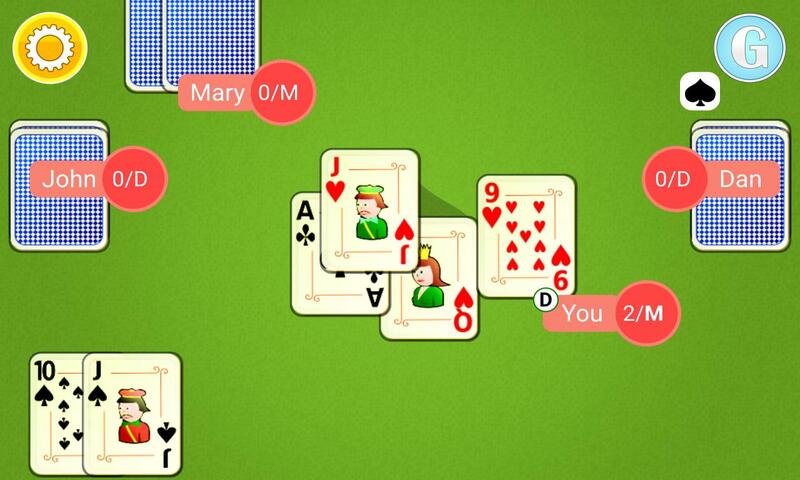 ✓ You can start the trick with any card but you must follow suit or play any other card if you cannot follow suit. ✓ The trick is won by the player who plays the highest trump or the highest card of the starting suit. ✓ To win the game you must be the first to score 10 or more points. 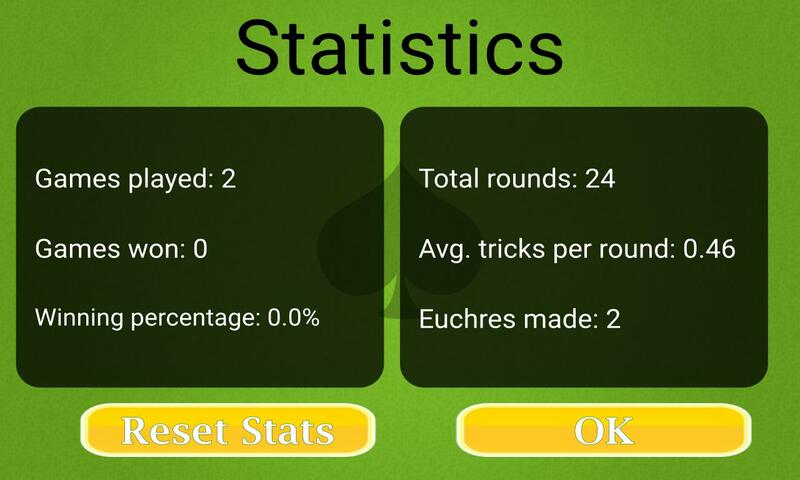 ✓ There is a statistics menu in which you can view the total games played, the percentage of won games, the number of rounds played, the number of euchres made. ✓ The jack of the trump is called the right bower. The jack of the same-color as trump is called the left bower. ✓ If you as a defender take 3 or more tricks then you achieve a euchre. ✓ If you as a maker take less than 3 tricks then you have been euchred. ✓ The makers are marked with an M. The player that chose the trump is marked with a bold M.
✓ The defenders are marked with a D.